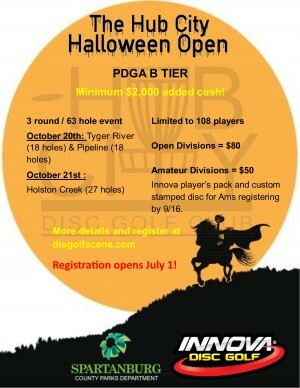 Hub City Disc Golf Club is excited again to host The Hub City Halloween Open. This will be a 2 day / 3 round event on 3 separate courses in Spartanburg County South Carolina: Tyger River (18 holes), Pipeline (18 holes), and Holston Creek (27 holes). 1) All Amateurs will receive an Innova player's pack with premium tournament stamped disc. Those registering by September 16th will be guaranteed shirt size. 2) Sun King voucher payout to amateurs. 3) Trophies for 1st place in all divisions. 4) Pro spots will be reserved until midnight on September 1st. At that time, remaining spots will first be offered to amateurs currently on the wait list. 5) If fewer than 4 players sign up for a division, they may be moved to the closest comparable division at the TD's discretion. FA2 division will play new red tees at Tyger and Pipeline. All other divisions will play regular tees (including 15 long) at Tyger and Pipeline. Hub City Disc Golf Club is responsible for all refunds/cancellations. Refunds and Withdrawals will be handled in accordance with the PDGA Competition Manual.